This image of the Trifid Nebula was taken by the VISTA survey telescope in Chile. 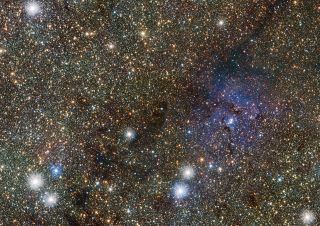 The photo, taken in infrared light, reveals two never-before-seen stars. Image released Feb. 4, 2015. The breakout box in this photo shows the two Cepheid variable stars discovered by ESO's VISTA telescope in a survey.